As I looked at the selection, I decided it was time to do another comparison of the value of this half share. It cost me $19 a week for the summer, and again this fall, the same, since we signed up early for both seasons. Most weeks I know this half share would have cost me more in the organic aisles of the local grocery stores. Here, proof again that it is true. I used Wegmans on line shopping tool, for our local store. They have some of the best prices in the area for organic. The smaller stores, like Roots and MOMs can be even more expensive. We had nine items this week. I did swap the red kale for some potatoes. I used the cost of the kale in my comparison because that is what we were sent. Most expensive to buy. Organic cauliflower and broccoli. $4.49 for cauliflower. $3.49 for broccoli. Spaghetti squash (theirs wasn’t organic) $1.49/lb. Mine weighs almost two pounds. Organic red kale was $2.69 each. Red leaf lettuce $2.29 each. Butterhead lettuce, not organic, $1.99. Hot peppers, not organic, $3.99 a pound. I had almost a pound of them. The only radishes at Wegmans on line were regular. Not the French Breakfast radishes we got. They were $1.99 a bunch. Organic baby beets, $2.99 a bunch. All told. A smidge less than $27 to buy. As for our fruit share this week. 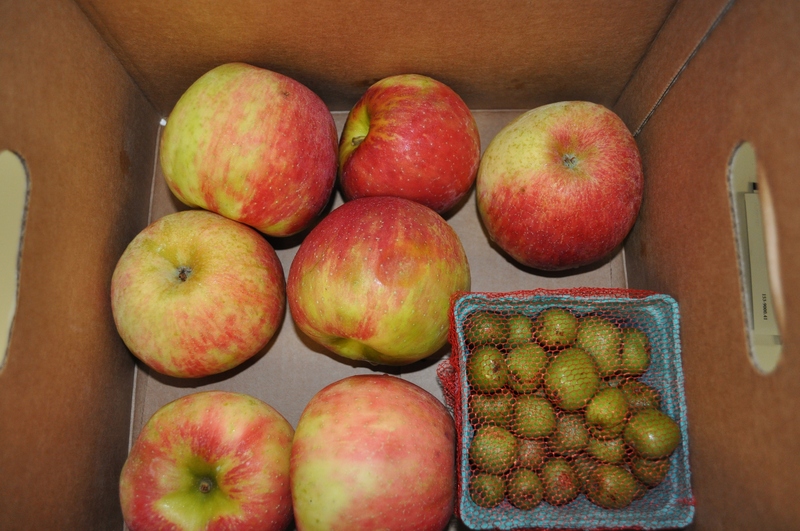 Seven organic honey crisp apples. At Wegmans these go for $3.49 a pound. Mine weighed slightly over 3 pounds. The kiwiberries. Who knows what they cost. They are rarely seen around here. Conservatively $4, maybe $5, if you can find them. Value, somewhere between $14 and $15. My fruit share costs $10 a week. Really worth it for those fruit varieties that are extremely hard to find without possibilities of pesticides. This week I didn’t photograph my chicken share. It was boneless skinless chicken breast, and a couple of whole chicken legs. 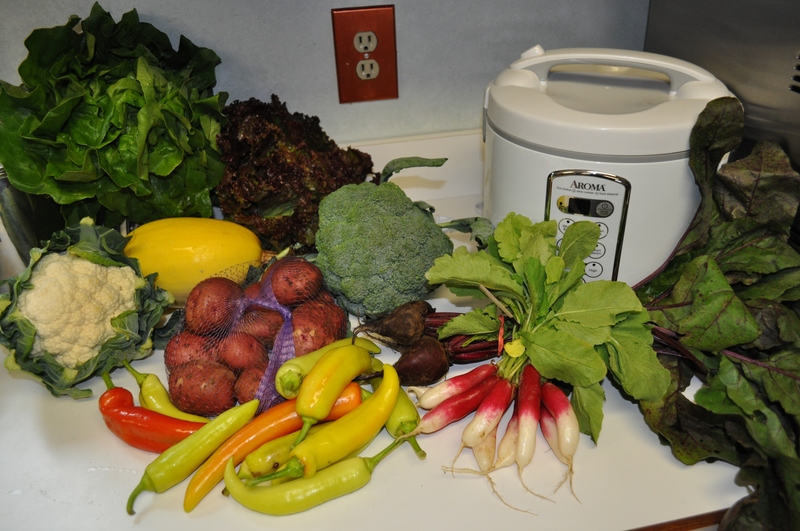 So, I will leave us with the photograph of a recent dinner with the Lancaster Farm Fresh chicken. The chicken breasts are usually parboiled first. I then make them into whatever suits my taste over the next few days. Maybe Caesar salad. Maybe chicken salad sandwiches. This time, I used some white wine, olive oil, some mixed herbs and quickly heated them in a moderate oven. The wine keeps them moist. I also made some mushroom gravy using the Whole Foods brand of condensed mushroom soup. I now know that I prefer the Pacific brand, as this was a little thinner. I added some of the cremini mushrooms too. Spooned over the chicken. Served with some brown Jasmine rice. 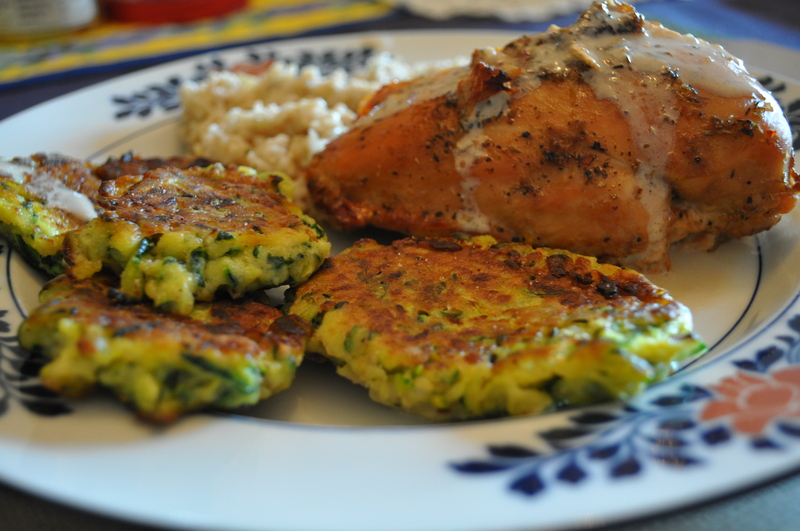 And, those great zucchini fritters I have made many times. That Smitten Kitchen recipe is now a staple in my recipe file. Posted in CSA, Food, LFFC, Locavore, Real Food and tagged cooking, CSA, Food, Locavore, real food, value of CSA, wegman's, Whole Foods. Bookmark the permalink.